If you need to hold your car at a reasonable height, these medium race car chassis stands are perfect for the job. They have a load capacity of 300kg each, meaning they can support most race cars. These stands come in a pair and will hold your car at a height of 18″, more than enough space to comfortably work underneath. The chassis stands are hinged at the top, meaning that moving them around the workshop, or to the circuit is easy. They have a wide base and are produced from high-grade mild steel – meaning that your car is very stable when sat atop the stands. 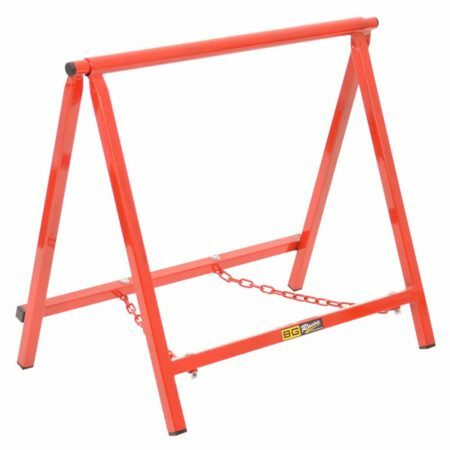 The chassis stands are also powder coated in a Red colour, ensuring they’re robust and durable. These stands have a height of 18″, but we also have small, medium and extra large sizes measuring 6″, 7″ and 24″.